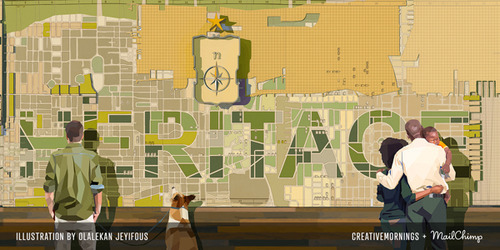 This month’s theme is Heritage, which was selected by our Cape Town chapter. The theme is presented by MailChimp who is an Official Partner of CreativeMornings. More than 6 million people use MailChimp to design and send email marketing campaigns. They support our headquarters so CM can continue to expand to new cities around the world! We are thrilled to announce that speaking on this theme is world class graphic designer, Richie Stewart of Commoner, Inc.! Here at CreativeMornings/Boston, we like to spread the love and give credit where credit is due. So consider this post a big, huge virtual hug to our newest sponsor - Dribbble. We brought Dribbble on board for our June event and lets just say, sparks flew! They describe themselves as “show and tell for designers” and this couldn’t be more accurate. The Dribbble platform is a hotspot for designers to share their work and connect with the community. It’s a space to show off your best work and maybe even score a job. Concurrently, Dribbble is also a wealth of inspiration and a vat of talent. It’s a great place to go when the creative juices are running low and you need a dose of visual awesome. The talent level on Dribbble is unmatched; if you are a designer and you are not on Dribbble, drop what you are doing and check it out. Based right in Salem, MA, we are so thrilled to have them as a CreativeMornings/Boston sponsor! We’re thrilled that CreativeMornings has been rebooted here in Boston. New England has such a widespread and diverse creative community and it’s fantastic to have the opportunity to gather some of that energy into one spot. Working with Keith Frankel, Richie Stewart, and co. has been such a pleasure and reminds us of how much talent there is right in our own backyard, and how CM and Dribbble have similar goals in connecting creative folks. Plus, who doesn’t love donuts? Seriously, how can you not love these guys?! After a brief pause, we are back in action and we couldn’t be more excited about it! 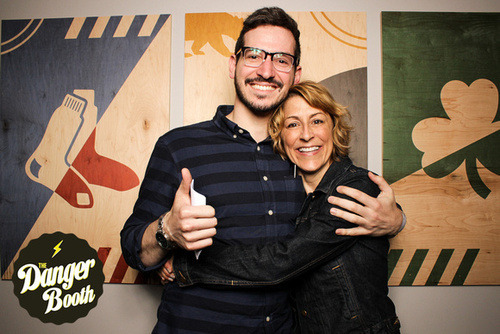 With Keith Frankel as our awesome new host, we kicked off our Boston reentry with the theme of freedom and an amazing talk from Susan Piver. (Watch the talk here). Big thanks to the Danger Booth for capturing our inner goofball, check out the gallery! To WeWork and General Assembly for the incredible space. To Barrington for caffeinating us. And a big huge thanks to Mailchimp and Shutterstock for sponsoring our lovely event. We’re super excited to be teaming up with Dribbble for our next event on June 27. The theme is minimal and we have the talented designer, Mr. Kirk Wallace joining us. Snag yourself a FREE ticket and we’ll see you there! Be sure to create your CreativeMornings profile and stay connected with our community! Boston is looking for a new organizer! We’re looking for a new organizer in Boston as well as SF and Milan (with help from MailChimp). CreativeMornings began to spread from NYC to new cities in 2009. Among the first chapters to come on board were San Francisco, Boston, and Milan. After almost 100 free events in these cities hosted by volunteer organizers and their teams, it’s time to pass the torch. To kick off 2014, CM is launching a search for new organizers to take charge of these three wonderful chapters. Bonus: We’re getting some help from our friend, Freddie at MailChimp! Each new organizer will receive a $1000 (USD) starter sponsorship from MailChimp for their chapter’s first event. Applications are due in February. To learn more, check out the original announcement here! 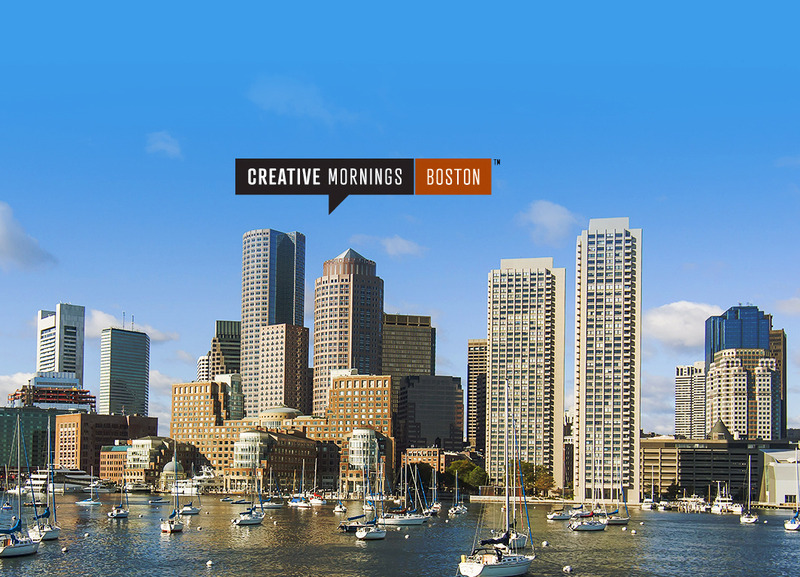 Welcome to the CreativeMornings/Boston city page! Check back here for upcoming events, new videos, and photos.